Corvus Energy has announced that it has achieved ISO 14001:2015 certification for its Environmental Management System and Processes in its operations in Bergen, Norway. Certification in its Richmond, B.C., Canada offices was achieved in March 2018. 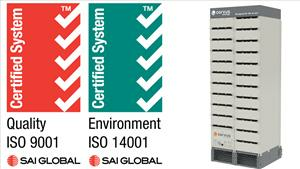 The scope of the ISO 14001 certification includes the environmental aspects of Corvus' design, manufacturing and service of products that Corvus can either directly control or influence considering the life cycle perspective of lithium-ion based energy storage systems (ESS). The purpose of the ISO 14001 standard is to provide organizations with a framework to protect the environment and respond to changing environmental conditions in balance with socio-economic needs. As a leading manufacturer of energy storage systems for maritime applications, Corvus offers the innovative Orca ESS solutions portfolio and has unsurpassed experience from 170+ projects, totaling over 120MWh and 2 million operating hours.